Now that our two children are grown and away at college, my wife and I recently decided to put our house up for sale and move to a small apartment in a neighboring town. We haven’t actually moved in yet, but today I had to go over there to meet with the Verizon tech who was setting up the internet connection. I parked my car behind the building and let myself in using the key fob which automatically opens the doors and took the elevator to the second floor. As I approached the door to our apartment, I was pleasantly surprised to see someone had placed a small bouquet of yellow flowers at the foot of the door. Naturally, I assumed it was from the building’s management. “What a nice thing for the owner to do,” I thought. I’ve lived in a lot of places in my life, but the landlord never sent me flowers before! Then I thought, “I wonder if this person is somehow trying to ingratiate herself with us and will become very needy….or involve herself somehow in our lives in an unpleasant way.” After all, some of the places I have lived were in New York City . After you’ve lived in New York City, you start to think about things like that. Then the Verizon tech called, I went downstairs and let him into the building and escorted him back upstairs where in about fifteen minutes he had completed his work. I thanked him, took his card and called his supervisor to tell him that I was happy with the service and thought the young fellow was very professional and friendly. In fact, the tech laughed at everything I said. That’s a sure way to win my favor. After all, she had written her apartment number on the card! I took the elevator and exited on her floor, and, flowers in hand, my eyes scanned the numbers on all the closed doors until I found the one that matched the number on the card. So I knocked, using the little metal door knocker which was identical to the one on every other door in the building. If she heard it, she ignored it, because as I stood there, I could still hear her talking. I knocked again, a little louder this time. But not a loud knock like the police had come to arrest her. It was more of a fun knock, like KNOK-KNOCK-KNOCK-KNOCK…..KNOCK-KNOCK!! Still no response. I put my ear to the door. I didn’t hear anything. Then I heard a woman’s voice say, “Just a minute….” and fully expecting the door to open, I stepped back and away from the door, still holding the little yellow flowers. There was a faint sound of metal against metal and then suddenly there was an eye looking at me through a little circular opening in the door. I had seen these types of openings in doors before, when I had been in apartment buildings in New York City. But there was usually a convex glass lens and the image seen by the viewer was a distorted fish eye kind of view. But this time, there was no glass separating the eye and me. The eye was pale blue and it was looking at the undistorted me. I could make out wrinkles around it. It reminded me of the eye of a very old whale. Just an eye surrounded by a large expanse of grey. “I hope you like living here,” the door said. 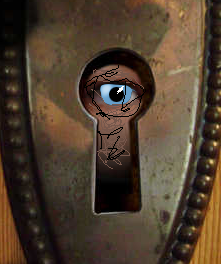 Then, suddenly I had the feeling that I wasn’t talking to a person, but that it was the eye of the building with solid brass eyelids and I was talking to the building. And it was studying me….looking me up and down….judging me to see if I was the type of human who was fit to live in it…. Quite frankly, I have always been very relieved that walls couldn’t talk–and I’d feel a whole lot better if doors couldn’t talk–or have eyes, either, for that matter.